E Grade at Glory Road, Gnangara. Picture: Eben Venter. The Valentine’s Day Criterium was held alongside the appropriately named Glory Road in Gnangara. 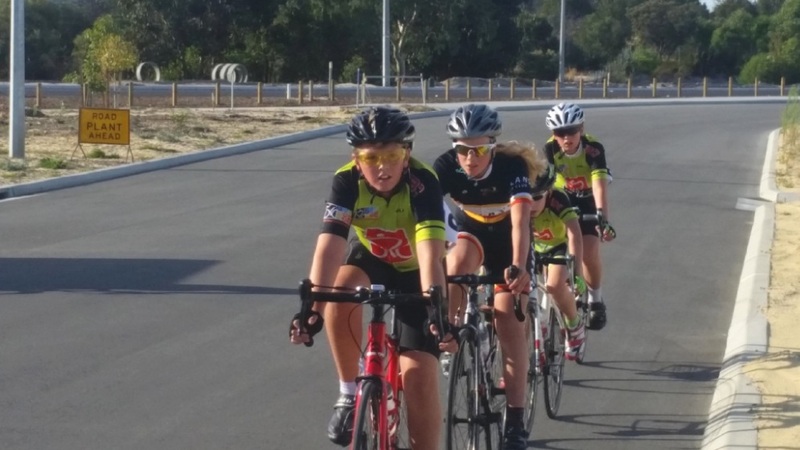 E grade displayed the future of road cycling, with NBCC youth squad members Nathan Venter, Curtis Atkinson and Dylan Venter claiming second, third and fourth positions. In the D grade men’s race, Richard Reeves and Peter Hunt worked well together to claim first and second. Similarly in C grade, Neil Thorpe won, with newly recruited Adrian Searle second. In his first B grade race, Brendan Atkinson finished an impressive ninth. The course itself, in a developing industrial estate, holds promise as a short-term local racing circuit. Masters racing was held at Herne Hill with a road race format. Edward Rose claimed second in E grade. C grade finished with an exciting four-way photo-finish: Chris Coote, elevated to his first C grade race, took third and Nick Vroomans fourth. B grade had Mark Welford claim second. NBCC maintains its lead in the team points for the summer series.